The property on Hyland Hill includes a little pond. Forty or fifty feet in diameter, it’s located in a hollow halfway down the slope right where the meadow meets the woods. A rivulet keeps it filled; an outlet notched into the opposite rim empties the overflow through a narrow trench and down the steep hillside. Though man-made, the pond is so well landscaped that it looks completely natural. The water and the setting are lovely in their own right, and this tiny ecosystem is congenial to wildlife that wouldn’t be present otherwise––minnows, peepers, dragonflies, and frogs. The pond seems to have been present here forever. Its presence out of sight from the house makes it feel separate and mysterious, a realm apart from both the meadow and the forest. There’s one other aspect of this place that draws me. When Edith and I took the introductory ramble that first sparked our desire to purchase this property, I immediately perceived the pond as a splendid spot for a meditation shack. I could go down there daily six months of the year to sit in stillness. I could meditate in a quintessential Buddhist setting. Of an evening, I could contemplate the moon. Even during our first summer on Hyland Hill, however, we decide that the pond seems sick. The water has grown turbid; the smell is heavy. A few feet below the surface, wispy aquatic plants have bloomed in great profusion. Wild irises mass along the far shore like tourists waiting on the dock for the Nantucket ferry. Frogs are clearly thriving in that environment, but I see no signs of the trout and perch that Paul and Doris stocked during their years of ownership. When autumn arrives, maple and ash leaves stream down from the nearby trees, float on the surface for a week, then sink out of sight. I gradually begin to grasp what I’m witnessing. These changes are all part of eutrophication, a natural sequence of changes that will gradually fill in, dry out, and convert the pond into just another part of the meadow. The pond isn’t really sick at all; it’s just . . . changing. 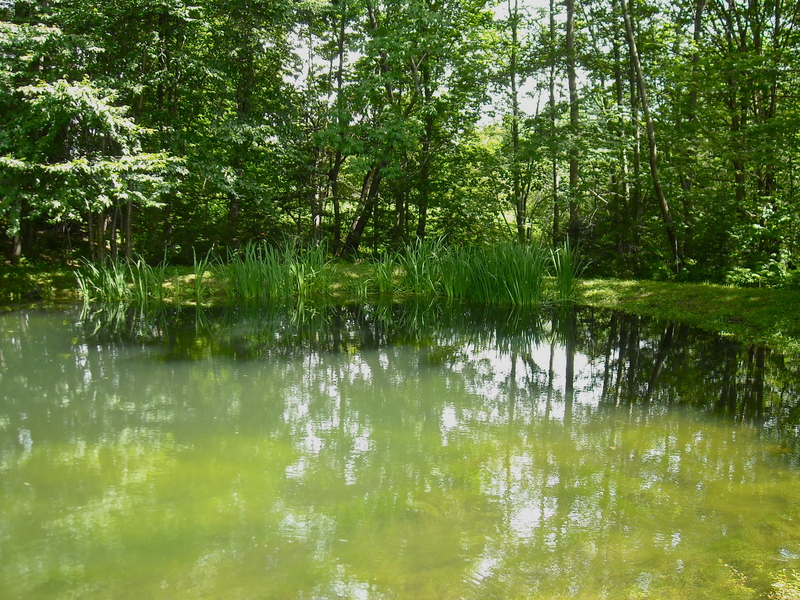 From Edith’s and my standpoint, however––the standpoint of human beings intent on having an attractive pond on their property––the process amounts to a terminal disease. It’s advancing rapidly. By our second summer on Hyland Hill, the water has grown dense with aquatic plants and smells more and more fetid. Other projects immediately take precedence. 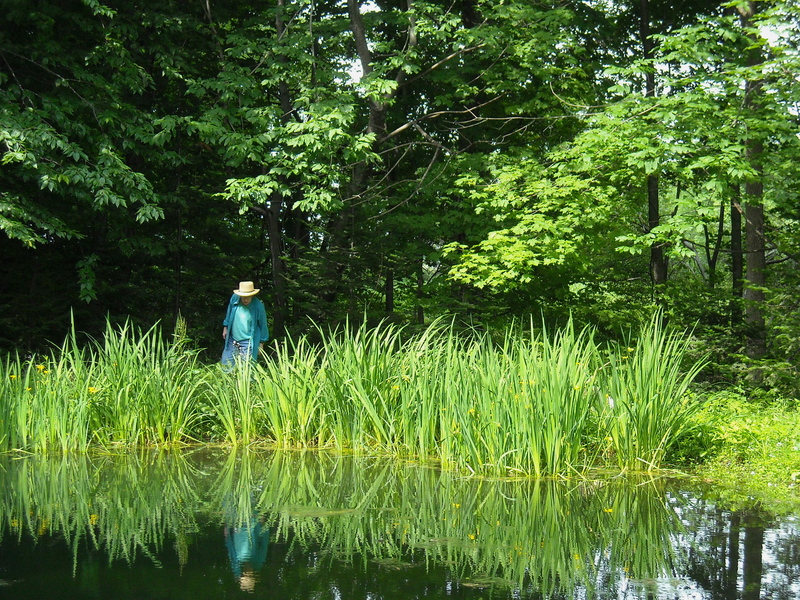 Edith and I have at least three dozen tasks on our list that have priority over spending $2,000 to upgrade the pond. Yet the situation continues to deteriorate. By late summer, the water has turned a hazy green-brown. Worse, it looks less like water than like a vastly intricate mass of vegetation, soft and filigreed, with little more than a thin, flat, transparent surface encasing it. To call this a dying place would be inaccurate. It’s very much alive. Mosquitoes, water striders, dragonflies, and other insects clearly thrive here. Minnows dart about in the shallows. 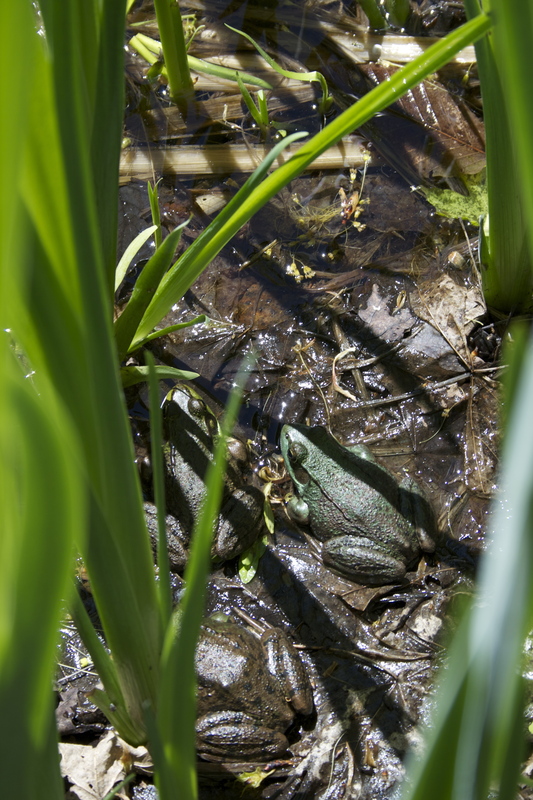 Frogs reveal their presence by their calls—cut cut cut cut—and by plopping into the pond abruptly when I approach the cattails. But these critters are clear signs of a transformation that we still hope to forestall and, if possible, to reverse. And so the question becomes: what should we do, and by what means, to preserve the pond?